‘Skyline’ finally touched the water this last Friday! With all the talk of the great coho fishing lately, we’ve been itching to get the boat in the water. The weather was pretty chilly and windy, but that didn’t keep us from launching the boat, setting up the rods and downriggers, and going for a short fishing trip just outside of Portage, Indiana. Several other eager fisherman joined us for the roughly 2 hour trip. We ran a mix of body baits, dodger flies, and a couple of spoons. For as cold as the water was, 37-38 degrees, the coho salmon were biting and kept us moving the whole trip. 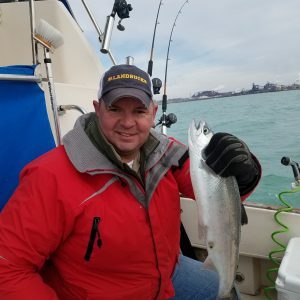 We ended up catching 8 decent coho out of 12 bites in a short period of time once we got set up. By the time we got back to the slip, the wind was blowing strong and temperatures had dropped to just above freezing, but everyone felt it was totally worth it! The plan is to make the lake crossing to Belmont Harbor sometime next week. The forecast already looks good with temps in the 50s. Also, just a reminder to follow us on Instagram (@skylinefishingcharters) for photo updates throughout the season!